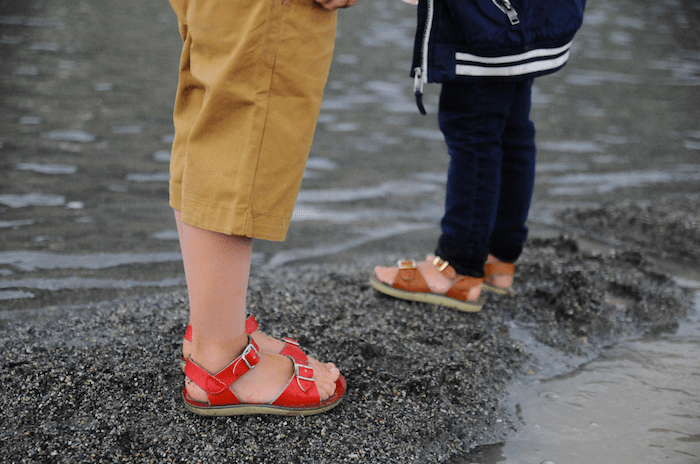 For today’s post we had one mission, to tell all of you readers about the killer deal Brickyard Buffalo is running with Navy Perl on Salt Waters for kids and women. They’re on sale over there for $27.99, about 25% off! Salt Water sandals are a Summertime staple over here for so many reasons. We love the classic look, and that they are a little bit more formal than flip flops, and easy for even the smallest feet to walk in. We are continuously impressed with how sturdy and hardy they are! These shoes go in an out of water, mud, sand, and the leather only gets better! 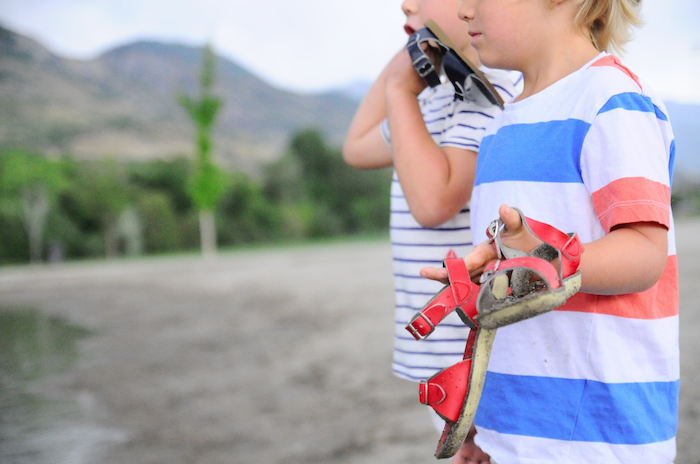 The longer our boys wear them the more comfortable they get, molding to their feet and breaking in over time. While we were shooting, one of the boys found there way to a recently acquired stash of Angie’s BOOM CHICKA POP popcorn in the trunk. We died laughing when we realized they each had their own bag going. So today’s post went from sharing one Summertime favorite, to two! 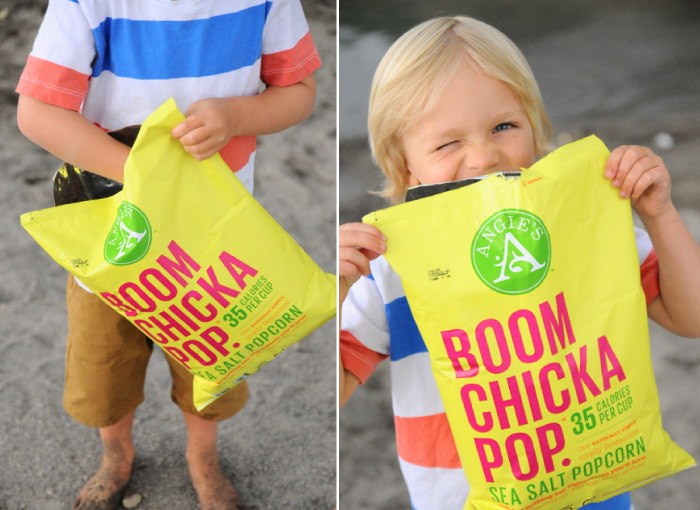 Boom Chicka Pop is Non-GMO, gluten free, whole grain, no artificial sweeteners or preservatives, it’s clean as popcorn can get these days which we so appreciate for our kids! We can’t get enough of this popcorn either, and at 65 calories per cup makes US really happy, too. Our favorite flavors are the Cheddar and Caramel mix (sounds crazy, but it’s amazing! ), White Cheddar, Kettle Corn and Salted Caramel. We can’t keep them in the pantry long enough, they’re usually gone the day we buy it. It’s been a great snack to keep in the car for snacks on the go, and if they make it home, you bet we’re eating it long after the boys have gone to bed, too! Find your next pair of Salt Waters at Brickyard Buffalo on sale, and after the deal at Navy Perl, and we’ve bought BOOM CHICKA POP in most grocery stores, but you can buy it online here too. I LOVE both Saltwater Sandals and Angie’s Boom Chicka Pop! I just remembered I have the caramel & cheddar one (and yes, they are freaking amazing together!!!!). I need to find the salted caramel one. We love Angie’s Popcorn and can eat a bag in one setting! It’s great seeing this small town business in Southern Minnesota grow nationwide!